another paper bought it for a prize. Ten thousand pairs of eyes saw what I did. some reader with my poem in their mind. A big thank you to Thomas for allowing me to share his thoughts and his poetry with you. As I have blathered on many occasions, the 70th anniversary of Puffin books is rapidly looming! 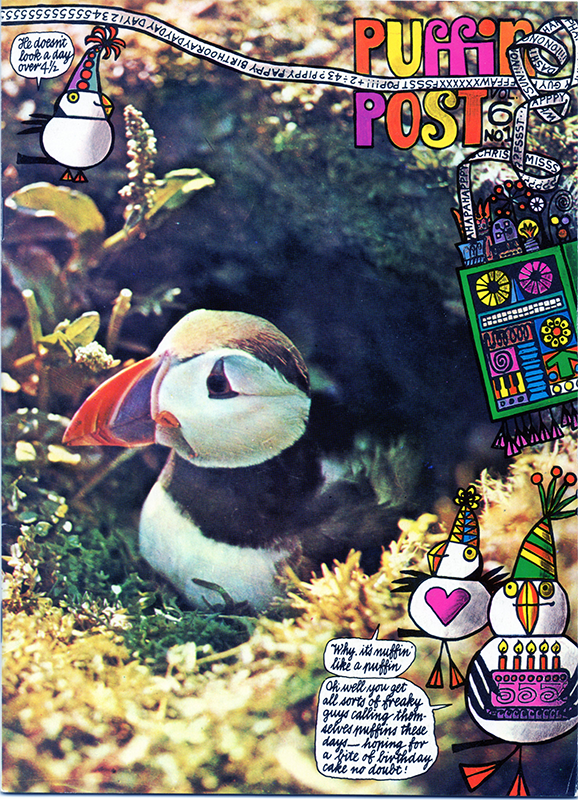 As part of the up-coming attractions Puffin Post is planning a Jill McDonald cover and Puffin Books are having NATIONAL PUFFIN SHARE-A-STORY DAY on 8 May – You can download the party pack from here. There is also a lovely little music video of the old Puffin song (how many of you remember it?). I will of course post any more news as I get it. I will also list any special reprints of Puffin classics that should be snaffled up for kids and grandkids. Ooh, I’ve gone all sentimental! Long time – no blog! It has been a fairly long time since I’ve had the time to put finger to keyboard and give any news, let alone any pretty pictures. I recently spotted a lovely example of a founders badge on ebay (I know I already have one!) but this was still mounted on its presentation card!! Suffice it to say that my budget outstripped my (only) fellow bidder. It is reassuring to know that it has gone to a safe and worthy home – Phil Baines, the author of the upcoming ‘Art of Puffin’ who has kindly allowed me to put a link in to his Flickr page. Thanks Phil! I have also been contacted by the hard working people at Seven Stories in Newcastle. They are the custodians of the Kaye Webb collection which is due to get an overdue airing as part of the Puffin anniversary celebrations. If you are in the area, or have any love for children’s literature, I would urge you to visit and support them as they are a vital and under celebrated resource for the nation. As I have said on previous posts, I have been fairly busy of late. I have not been idle though. I have a few choice items to share with you shortly. As you know I have a love of the ‘throw-away’ items, and I have landed a truly marvelous piece of graphic design. I also have a little project under my hat that may (or may not) see the light of this website. Many thanks the Glen, Phil and the many ex puffineers who have contacted me over the past few months. I promise to answer as many of the questions and queries (particularly the one about the mysterious code that appeared to have no published key!) as I can over the next weeks and also give you all some new items to share and enjoy. 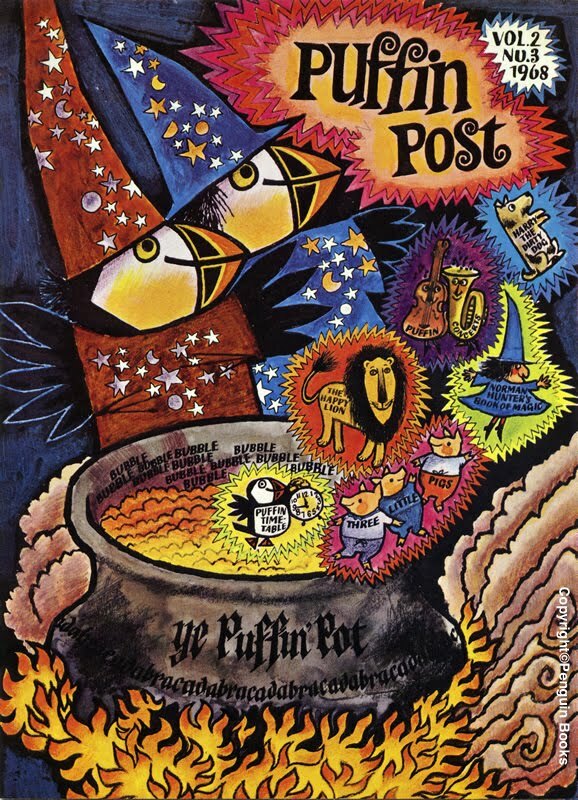 I know that these pages are mostly dedicated to the golden age Puffin Club, but for those of you who have been holding off giving your younger reader (6+) a membership of Puffin Post – hesitate no longer. 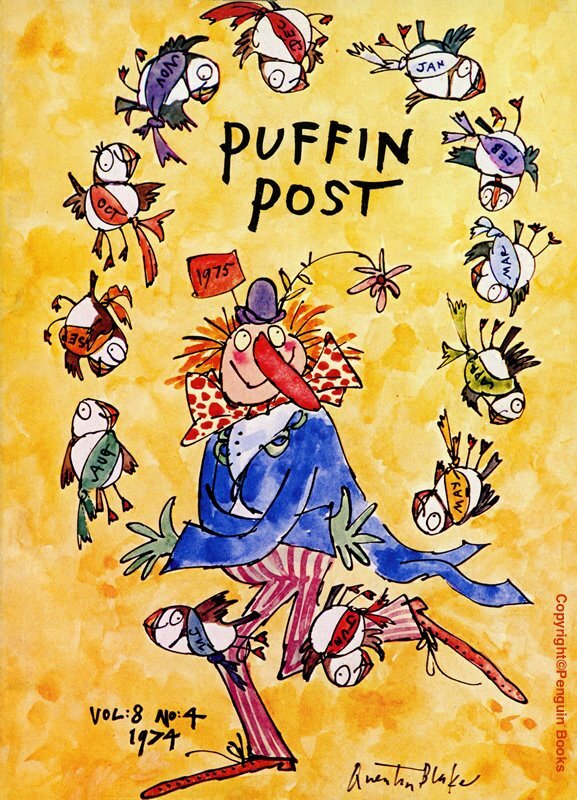 January sees the launch of Puffin Post for ‘Pufflings’. I’ve only seen the launch info in the latest copy of Puffin Post, but this looks like the new incarnation of ‘The Egg’. 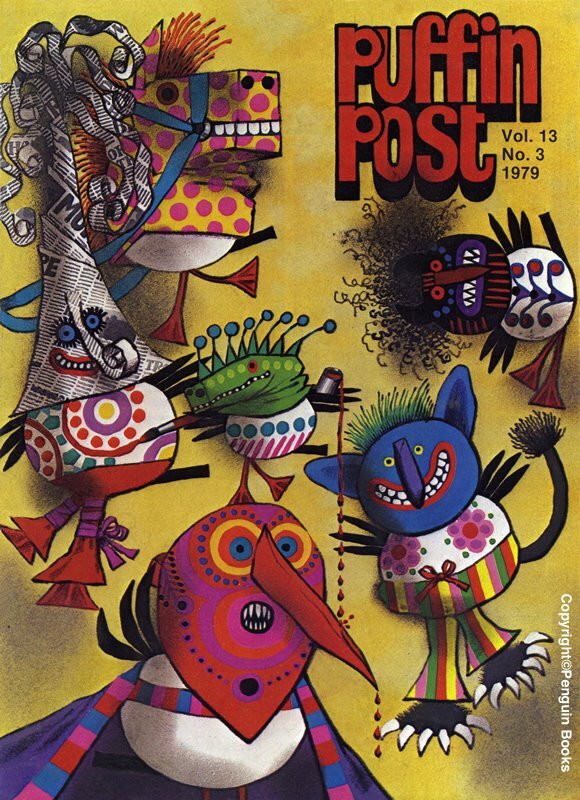 Incidentally, the latest issue of Puffin Post is the most art focused yet! Nice one Ptolemy! A seriously overdue restoration – and a blinder! For those of you who don’t know the Happy Lion books (rather quirkily translated from the French), Jill’s artwork is a very faithfull copy of the style. By this point, I think she had really got into the swing of the covers. The first time I saw this cover I thought it was enchanting – my kids have said the same. A big apology for all of you who follow this blog – I have literally been working round the clock on other projects, and something had to give! I will do my best to bring you some new things soon. Slightly out of season, but fun none-the-less. Featuring a short story by Leon Garfield, and in depth guide on how a book is published by Felicity Trotman, a centre spread on mask making, a profile of author Dorothy Crayder, a charming piece by Violet Bibby on finding Treasure (stories) from the past and photos from two forthcoming adaptations – Southern TV’s ‘The Ravelled Thread’ and BBC TV’s ‘The Enchanted Castle’. Not a bad little collection! Another amazing Quentin Blake cover – you will probably have seen this one as part of the publicity for the new club. It’s certainly a vivid piece of work, and again, one of my favourites. Slightly drier content in this one! A historical story by Barbara Willard entitled ‘Save England!’, a story ‘The Siege of Trapp’s Mill’ by Annabel Farjeon, A piece about the author John Masefield (The Midnight Folk etc. ), and a more adventurous tale by Peter Dickinson -‘Up and Beyond’. Jill McDonald has two nice scale pieces – Part 6 of Odways ‘Tales of the Golden Fleas’ and a short-lived character ‘McDonald McDonald’ – the arch detector of useless (but fascinating) information. A great one for anniversary fever! 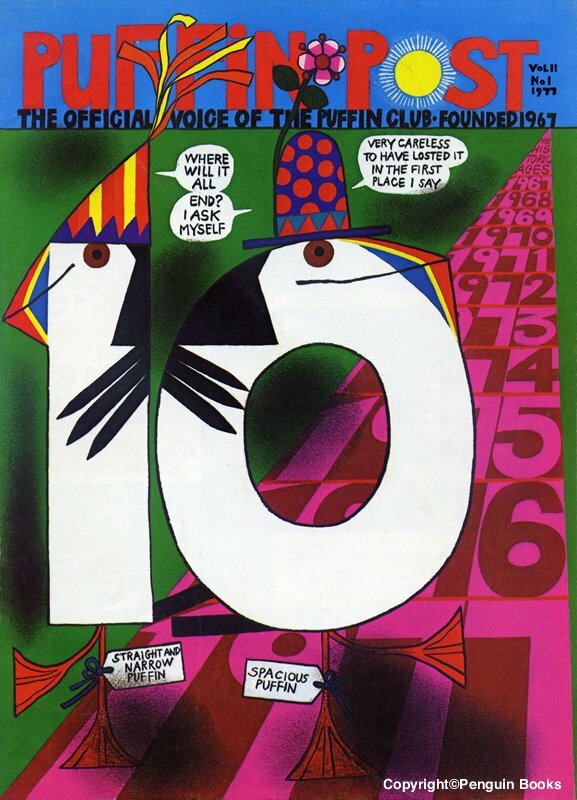 This issue included a brief history of the club up till that point as well as Jill McDonalds memories of drawing Fat Puffin (previously posted). Also included was a short birthday story by Elisabeth Beresford, a piece about Ponies by Flambards author Kathleen Peyton and an interview with Jan Pienkowski. 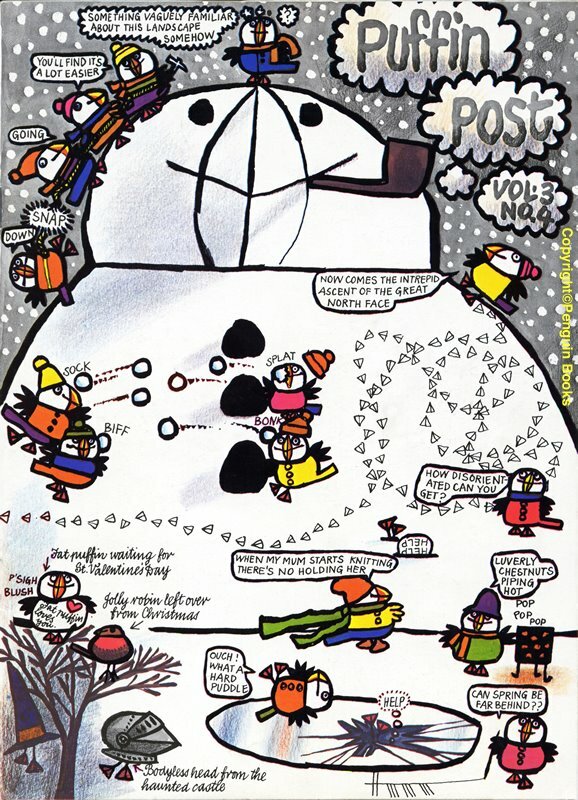 Bundled in with the magazine was the 10th Birthday Exhibition announcement with a special board game called ‘Swoop’ designed by Merlin Southwell printed on the back – not many have survived! Okay, this isn’t a typical spring/summer image, but it’s so full of wit and humour – I defy anyone who says this doesn’t offer something for all ages.